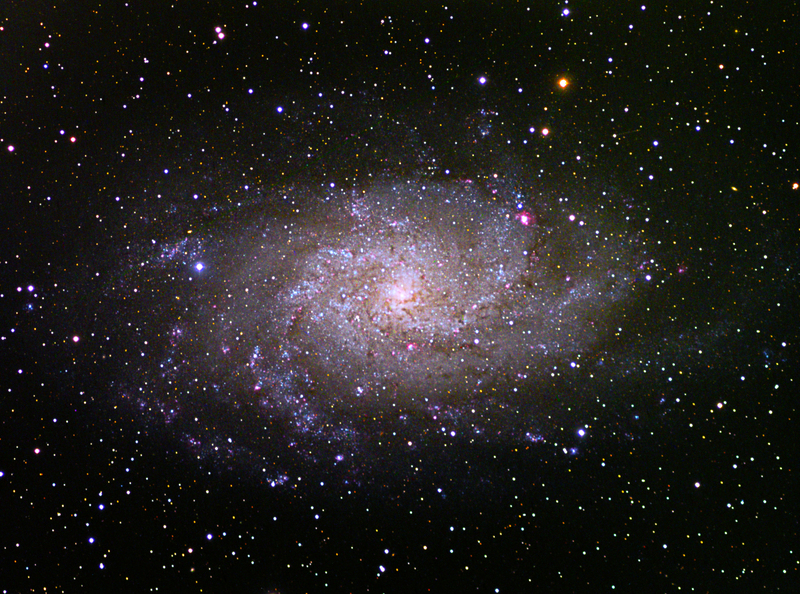 The Triangulum Galaxy is a spiral galaxy in the constellation Triangulum. It is also known as Messier 33 or NGC 598, and is sometimes referred to as the Pinwheel Galaxy, a nickname it shares with Messier 101. With a diameter of about 60,000 light-years, the Triangulum Galaxy is the third-largest member of our Local Group of galaxies. The Local Group is a cluster of galaxies which includes the Milky Way Galaxy, Andromeda Galaxy and about 44 other galaxies. The Triangulum Galaxy is estimated to hold 40 billion stars, compared to 400 billion for the Milky Way and 1 trillion for the Andromeda Galaxy. At a distance of 3 million light-years away, It is one of the most distant astronomical objects that can be viewed with the naked eye. Viewing it without the aid of a telescope requires exceptionally clear skies with no light pollution. It ranges from easily visible in dark skies to a difficult averted vision object in rural or suburban skies. For this reason, the Triangulum Galaxy is one of the critical sky marks of the Bortle Dark-Sky Scale.